The news follows comments Slash made last August in an interview with U.K. magazine Classic Rock in which he said that Guns N’ Roses’ future plans likely would include a new album. A new studio album would be the first from Guns N’ Roses since 2008’s Chinese Democracy, and the first to feature Slash and founding bassist Duff McKagan — who both rejoined the group in 2016 — since the 1993 covers collection The Spaghetti Incident? Slash currently is touring Europe with his solo group Miles Kennedy & the Conspirators. That leg winds down in mid-March, but the trek will continue with a series of South American dates in May and early June, before heading back to Europe for more shows scheduled through early July. 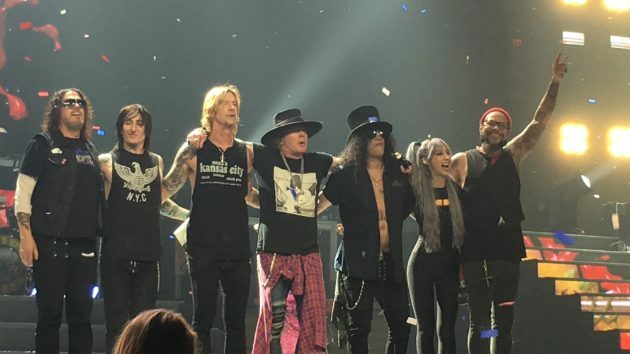 After that, Slash Featuring Miles Kennedy and the Conspirators will launch a late-summer North American leg running from a July 15 concert in San Francisco through an August 13 performance in Orlando, Florida.